No big deal, except whether it’s one pound or ten–that’s “up a little bit.” So I go in regretting the extra french fries I ate the night before and expecting to have gained half a pound or so. And I hear I’m “up a little bit” and relax, because I must be about where I thought I’d be on the scale. And then I look at my actual numbers, and find that I’ve gained a whole pound…or two…and it’s like someone has popped my metaphorical balloon. So lately I’ve been whining and moaning and complaining about being “up a little bit” all the time, and about how “it’s just not working like it should,” even though the problem is still probably a combination of portion size errors and overdoing the extra points on weekends. I’m in a rut, plain and simple. I even started looking at some of those services that send you frozen meals for each day and seem so simple…but after seeing the prices, I realized they’re just not practical for me, even if they would work. I did try something new, though. 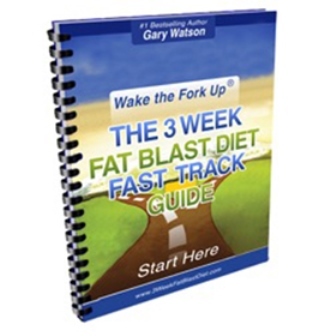 I signed up for a 3WeekFatBlastDiet account. I figured that maybe if I forget about Points and just count calories, maybe…hopefully…that will at least get me in the routine of tracking and being mindful of how much food I’m consuming. I even did track everything on Friday, but then the weekend hit, and I was literally running around and eating portions of meals in-between errands. But the holiday is over, so it’s all back to normal tomorrow. It’s interesting and different because 3 Week Fat Blast Diet gives me more calories per day than Weight Watchers (as far as I can figure), but no “extra” or “anytime” calories to save throughout the week. So I’m going to have to figure that out…maybe modify things somehow to work in my weekend treats. I just hope it will help, at this point. Because I have to figure out something, or I’m going to undo everything I’ve already done. 8 days to go.